With cloud computing becoming a major benefit for organizations of all sizes, some have abandoned the idea of having on-premise servers at their place of business. This could end up being problematic, however, as data security and privacy of cloud-based resources have been known to be often less than reliable. If you are looking to host your own IT in-house, there are some issues you have to see to before you can start purchasing hardware. If you haven’t ever had on-premise hardware, you likely haven’t considered where this hardware will go, how it will keep, etc. The first thing you need to understand is that while it doesn’t seem like a problem to store your hardware on top of a cabinet or on a shelf, when your business invariably grows, any money you saved by shoving your centralized technology into any unused space will be thrown out the window (and then some) when you have to deal with downtime when your disorganized mass of wires and components has to be unhooked and reconnected properly by professionals. On the other hand, if you get a server rack off the bat it may seem like a bit of overkill, but, rest assured, when you are looking to enhance your centralized infrastructure, adding additional machines to an orderly server rack will be of great benefit. Additionally, make sure to get a rack that is right for your needs. Server racks are measured in rack units, or “RU”, and typically come in either full-height (42U) or half-height (24U). There are also-wall mounted cabinets that can be used to house servers and switches. Regardless of what server options your business chooses, when you aim to host your own hardware, you will definitely want to have a plan in place as to where you are going to put it. Servers are extremely hot and loud. They are also extremely important and likely hold a fair amount of sensitive data that you don’t want exposed. Your best bet is to isolate your company’s servers in a closet or designed server room. If you don’t have anything like that in your space, you can build one by partitioning part of a closet or room simply to house your company’s central infrastructure. This will also give you the chance to consider what kind of cooling system you will have to install. You should know before you set out that cooling is one of the major considerations any organization looking to house its own hardware has to make. Since it is a bit of an investment, you should know exactly what your cooling system will have to look like before moving any piece of hardware into your new server room. Now, if you are only going to be housing a BDR or some network attached storage (NAS) or some networking equipment, you won’t really need to consider cooling as long as the room has good ventilation. When you start filling a server rack, however, you have to consider that each of those machines puts off a certain amount of heat, and that heat can significantly shorten the life of that equipment and cause hardware failure and corresponding downtime. Another variable you’ll have to consider is that you have coverage of your cooling efforts. Many businesses have dedicated HVAC systems in place that don’t function after people leave for the day. This means that any server-room-based air conditioning (or refrigeration) will have to be set up independent of the location’s HVAC system. 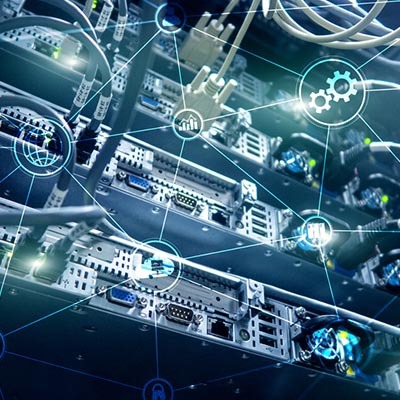 Once your cooling system is taken care of and your servers are in place, you will inevitably be adding more hardware as your needs/business grows. This will result in a lot of new wires and cables connecting elements of your server rack. If you aren’t careful, good intentions could turn into a complete mess. With wiring a tedious process, after only a little while, your server cabinet could end up looking like the one pictured on the left. For the server that looks like that, there is only one remedy, a complete renovation. The one on the right looks nice, but was only possible after the technician took a complete workday to sort through all the mess on the left. Nine hours of a technician’s time is expensive. To give you an idea, the average engine replacement for a car takes 18 hours. You will want to label everything, as well as document the entire server rack so that you have a key in which to quickly get at certain hardware if the underlying performance starts to wane. Of course these things are always going to be handled by an IT technician, but ensuring that you have all the materials beforehand can make these processes easier for everyone. One suggestion is to leave a label printer in with your hardware. That way servers and networking equipment can be properly labeled with their names and the corresponding IP addresses. Installing hardware for your small business can give you control over how you manage your own IT and allow you to make security a priority, but it can also be filled with hassles. If you would like more information about how to plan and manage a server room, contact Washington Works today at 301-571-5040. Washington Works has been serving the Bethesda area since 2005, providing IT Support such as technical helpdesk support, computer support, and consulting to small and medium-sized businesses. Google Chrome is much more than just any old web browser; it’s the most popular web browser in the world, being installed automatically on Android smartphones and the browser of choice for countless desktop users. Today, we want to help you get the most out of your Google Chrome web browser. Learn more about Washington Works and what we can do for your business. Copyright Washington Works. All Rights Reserved.